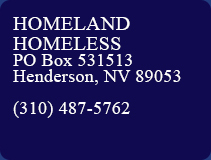 Homeland Homeless – Helping Those Who Helped You! Helping Those Who Helped You! When many young men and women join the military during wartime, they are never the same when they return. After fighting for their country, they come home somewhat disillusioned by the circumstances that confront them. Many of them are unable to secure employment, housing, and other basic necessities of life. This has often caused many veterans to retreat into depression. As a result of not being able to adequately function in society, they resort to drugs believing that this will solve their problems. Unfortunately, this only leads them down a path of further destruction. Homeland Homeless is dedicated and committed to reach beyond the immediate needs by providing information to veterans that will assist them in identifying some of the critical life essentials. In our effort to reintegrate these veterans into society, our organization assists the veterans in procuring the following: transitional housing, vocational training, job placement, psychological evaluation, counseling, legal assistance, substance abuse treatment, health care, and comprehensive case management. Homeland Homeless, Inc. is a 501(c)(3) non-profit organization established in 2007 that provides services to disabled and homeless veterans. The organization identifies homeless veterans and provides them with food, clothing, and necessary hygiene essentials. Veterans receive a step-by-step process of the requirements needed to receive eligible benefits. Veterans are also referred to agencies within and outside the Veterans Administration that can also assist them with their transition to civilian life. Our mission is to provide services to disabled and homeless veterans and ensure that they are aware of the services that they are eligible to receive. In our effort to make this vision a reality, our organization will provide counseling to veterans and guide them to transitional housing services. Additionally, we will assist them in identifying agencies that provide food, clothing, and treatment for PTSD. Veterans will also be given information regarding agencies within and outside the Veterans Administration department that will further assist them in obtaining the services that so desperately need. It is the belief of this organization that all students should be afforded the opportunity to pursue their dreams. We understand that many students do not have the financial capacity to enroll in many of the universities. 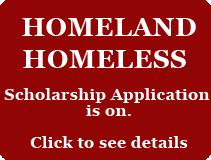 Therefore, Homeland Homeless will begin its scholarship program in the fall of 2017. We will provide scholarships to students who successfully complete the application process and submit all materials in a timely manner. We would love to give every applicant some form of financial assistance. However, we will only be able to offer a limited amount of scholarships. We will review all applications and scholarships will be awarded to the most promising applicants.